Good morning, Crafters! 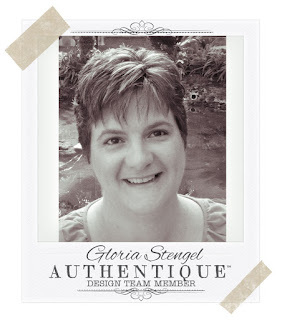 This is Gloria Stengel and I have a huge surprise post for you today...12x12 page layouts! 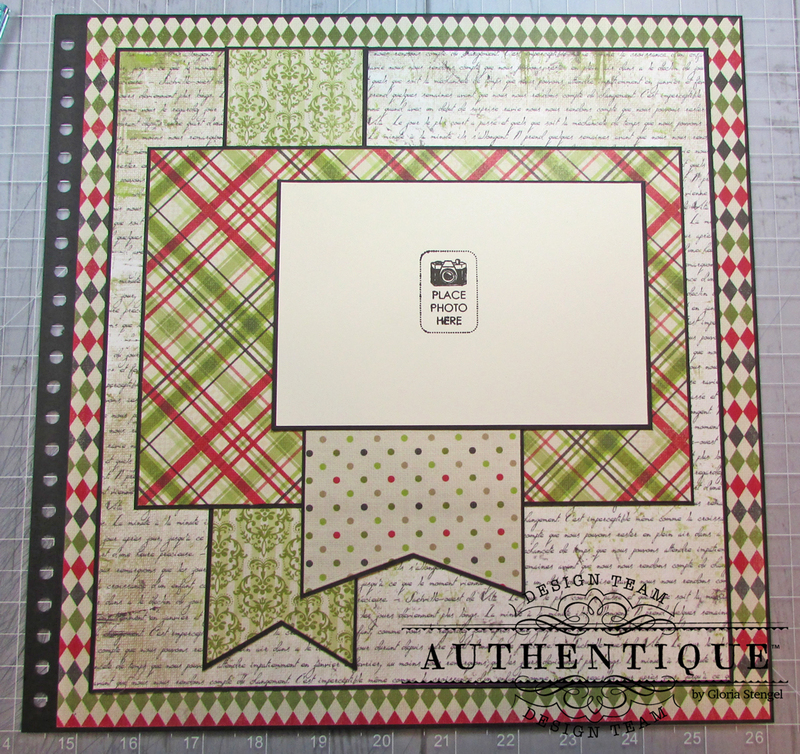 It has been roughly three years since I created a 12x12 layout! I have been in paper heaven this past week! I forgot how much I love to make page layouts! 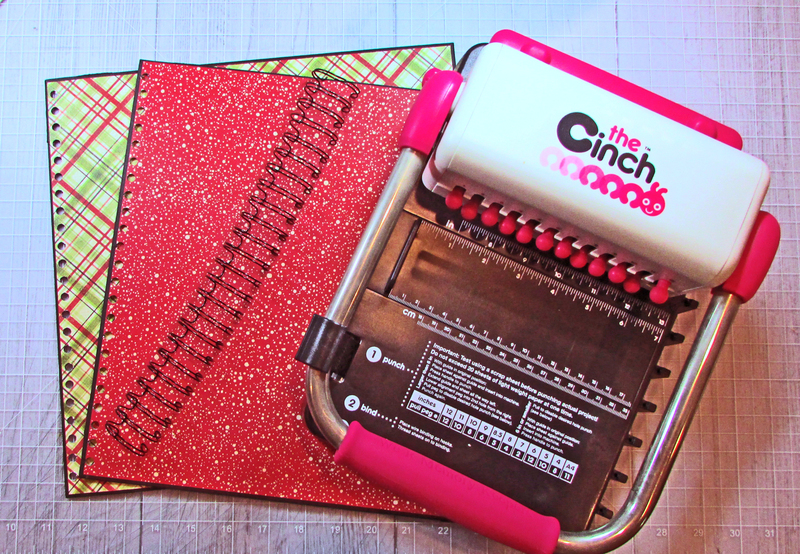 I have embarked upon a mission to create a 12x12 spiral-bound album, and I have two of the inside pages to share with you today! 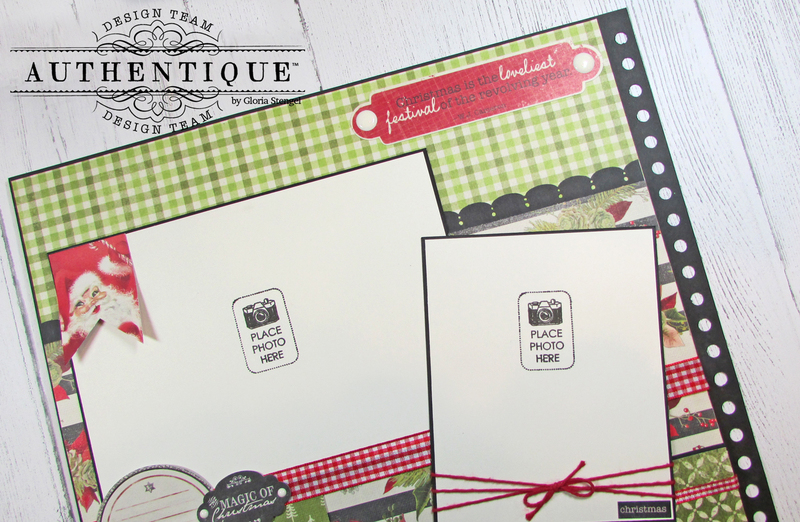 I have a small tutorial for each page to help you in creating your own layered layouts! I am not sure that these pages will face each other in the book, but I have placed them this way for the photos. Once I have the covers and more pages completed I will decide on the placement. I have used papers, stickers, and punch-outs from the Nostalgia, Jingle, Alpine, Vintage Christmas, Festive, and Peaceful Collections (so far, I am sure more will be conscripted by the end of the project). 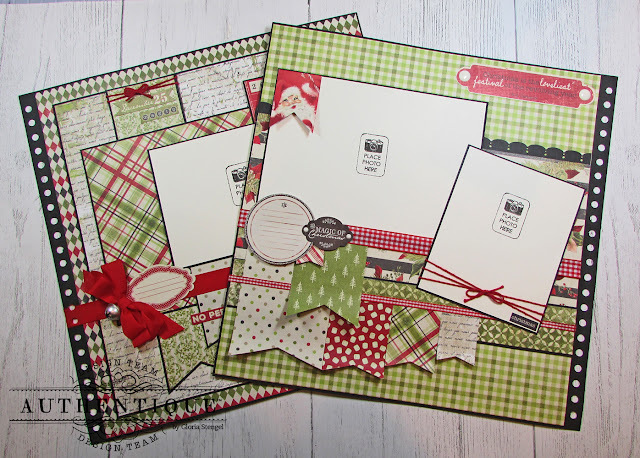 The various Christmas and Winter Collections co-ordinate very well, which makes it fun to mix them up and use older, retired collections from my stash with the newly released collections! This page is filled with layered banners and has space for one 5" x 7" photo and one 4" x 4" photo. Sorry for the blurry photo! Start by punching holes on the right side of a 12" x 12" piece of black, heavy-weight cardstock. (If you wish to use your pages in a different style of album, or for display, you will have to adjust your measurements accordingly.) 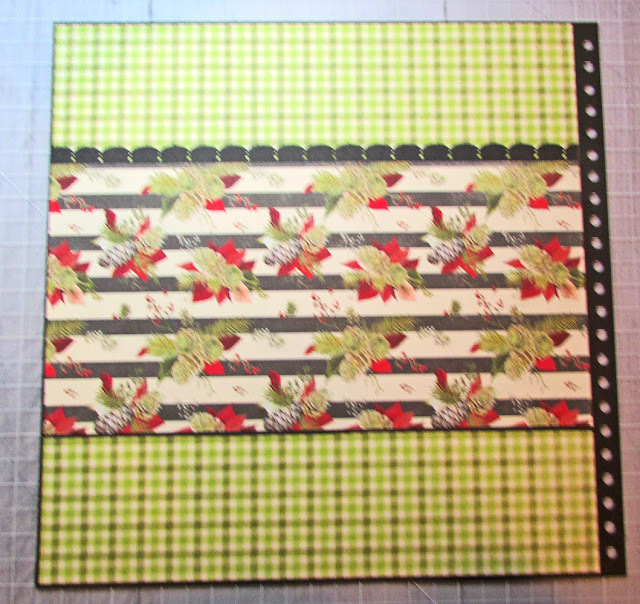 Trim Nostalgia Six (green plaid) paper to 11 7/8" x 11 3/8" and attach it to the black cardstock base. Punch one long edge of a 6 1/2" x 12" piece of black cardstock with a decorative border. Trim the punched black cardstock to 6 1/4" x 11 3/8" and attach it to the center of the page with the decorative border at the top of the panel. Trim Vintage Christmas Two paper (stripes and pine cones print) to 6" x 11 3/8" and attach it to the punched piece as shown. Trim Festive Yuletide paper (green "X" print) to 1 1/2" x 11 3/8" and mat with black cardstock cut to 1 5/8" x 11 3/8". Wrap 1/4" red gingham ribbon around the center of the paper strip. Attach the strip to the lower edge of the page, approximately 2 1/4" from the bottom edge. Trim various scraps (or papers from 6x6 pads) into banners of various sizes. Arrange the banners as shown above. Wrap 5/8" red gingham ribbon around the page at the top edge of the banners, roughly 4 7/8" from the bottom edge of the page. Trim cream cardstock to 5 1/8" x 7 1/8" and mat with black cardstock cut to 5 1/4" x 7 1/4" and place this photo mat onto the left side of the page, tucking the bottom edge under the ribbon as shown. Make sure the photo mat is 1 3/4" from the top edge of the page and 3/8" from the left edge of the page. Trim cream cardstock to 5 1/8" x 4 1/8" and mat with black cardstock cut to 5 1/4" x 4 1/4". Wrap the bottom edge with red twine and tie a bow. Attach the photo mat to the page at an angle as shown. Attach a sticker sentiment tag to the upper right corner of the page. (This one is from the Festive Details Sticker sheet.) I added two white enamel dots to the sticker tag. Punch out a Santa banner from the Jingle Elements sheet. Attach the banner to the top left corner of the larger photo mat. Also note, that I ended up tucking the ribbons under the printed paper on the right side of the page rather than allowing them to wrap around the hole-punched edge of the page. Start by punching holes on the left side of a 12" x 12" piece of black, heavy-weight cardstock. Trim Vintage Christmas Ten (diamond print) paper to 11 7/8" x 11 3/8" and attach it to the black cardstock base page. Trim Peaceful Solitude (script print) paper to 10 3/4" x 10 1/4" and mat with black cardstock cut to 10 7/8" x 10 3/8" and attach the panel to the center of the page. Trim Nostalgia Two paper (green damask) to 10 1/2" x 2 1/2" and cut into a banner shape. Mat the banner with black cardstock. Attach this long banner to the left side of the page, approximately 3" from the left edge, as shown. 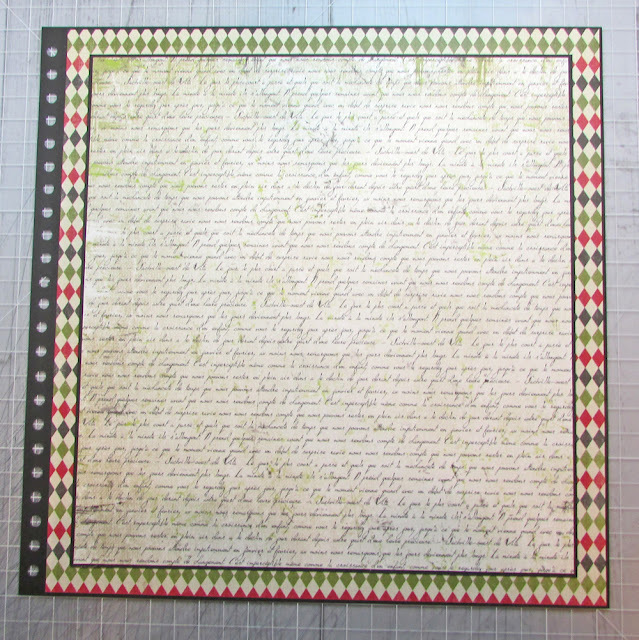 Trim Nostalgia Seven paper (red and green plaid) to 6" x 9" and mat with black cardstock cut to 6 1/8" x 9 1/8". Attach this panel to the script panel, approximately 2 1/2" from the top edge of the page and 1 3/4" from the left edge of the page. Create another banner from Nostalgia Eight paper (dots) cut to 4 5/8"x 3 5/8". Mat with black cardstock. Attach this banner at 5 1/4" from the top edge of the page and 4 1/2" from the left edge. Trim cream cardstock to 4 1/8" x 6 1/8" and mat with black cardstock cut to 4 1/4" x 6 1/4" and place this photo mat onto the right side of the page, approximately 3" from the top edge and 4" from the left edge. Overlap the dotted banner, as shown. Cut a tag shape from printed paper (I used a bit of red grid paper, Festive Merry Collection). Mat the tag with black cardstock. 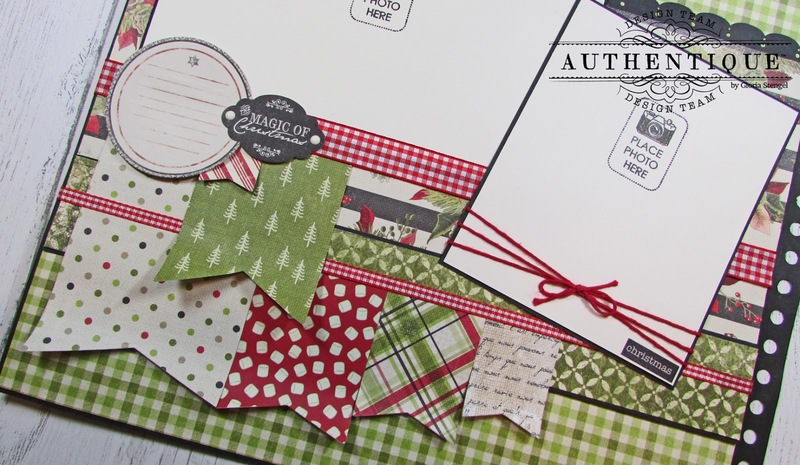 Add two bits of Nostalgia Seven paper (red and green plaid) to the tag. Attach a snowflake brad to the tag, then add a snowflake sticker to the lower left corner of the tag (Nostalgia Details sticker sheet). Also add the date, as desired (stickers from Festive Elements sticker sheet). Tuck the tag under the upper right corner of the photo mat, as shown. Add the "let it snow" sticker (Nostalgia Details sticker sheet) to the upper right corner of the photo mat. Attach a journal spot (Festive Details sticker sheet) to the right of the bow. 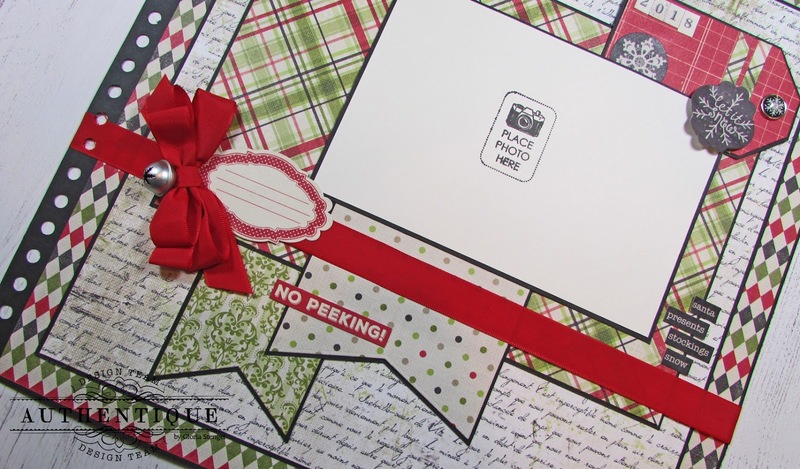 Glue the "no peeking" punch out (Jingle Elements sheet) just under the ribbon, as shown. Attach some word stickers (Festive Elements sticker sheet) to the lower right side of the photo mat. Thanks for stopping by today. 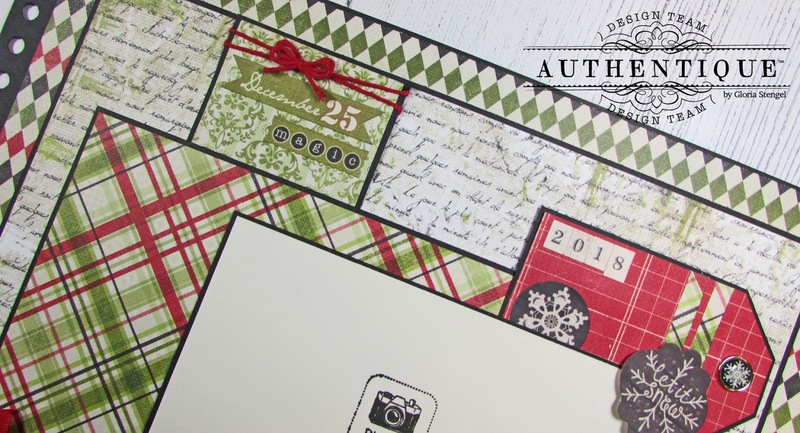 I hope you are inspired to pull out your Christmas papers and make some layered layouts! These are perfect for frames, shadow boxes, and albums. The layouts can be less dimensional by removing the bows or other dimensional elements.